The SQEK 2012 New York City conference is now concluded. During an intense five days of lectures, talks and discussions with academics, activists and an interested public, New Yorkers learned the facts about political squatting, the big building occupations called social centers, and the political and cultural differences in squatting conditions between European countries. Part of the standout event, an hour and a half meeting with SQEK researchers at the Living Theatre, has already been mounted to the web by Sebastian Gutierrez. Sebastian was the producer of the “Squats, Social Centers and Autonomous Spaces” panel at last year's Anarchist Bookfair in NYC, which is also on YouTube. Our week began last Thursday, February 23rd, with a reception at ABC No Rio. There we met our hosts, Lower East Side squatters like Steven Englander, Matt Metzgar and Bill Di Paola, all of whom are still activists in the neighborhood. We were also greeted by artist sympathizers like Rebecca Howland, Ann Messner, Peter Fend and Tom Otterness. 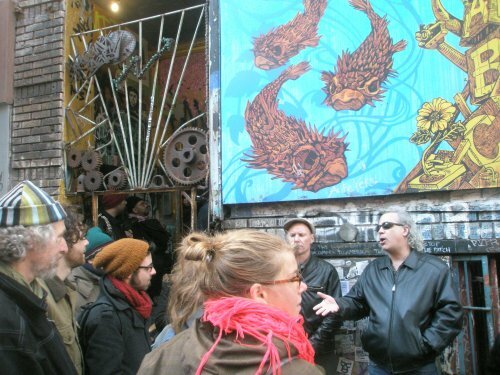 Matt and Bill later led many SQEKers on tours of the squats, most now legalized as low income cooperatives. Miguel Martinez has already written about these visits and the NYC squatter movement in two texts on his blog, “Tras las huellas de las okupaciones en New York City” (in the footsteps of the NYC squatters), at miguelangelmartinez.net. Miguel writes in Spanish, but includes numerous photos and some original movement texts in English. The next day we spent in a conference room at the Hilton, doing a day-long special session. It was called “Squatting and Social Centers: Resistance and Production of Critical Spaces” for the American Association of Geographers convention. (You can hunt down the abstracts of the papers from the URL below.) These sessions were very interesting, and the room was frequently packed. Numerous other researchers interested in squatting also participated, among them once-imprisoned German gentrification expert Andrej Holm. The next day we relaxed at the Remedy coffeeshop downtown in the morning, and then trotted to the Living Theatre to talk. I was especially pleased that we could talk there, since Judith Malina is such an important figure in anarchist culture. She and the late Julian Beck were also, appropriately enough, prominent in the occupation of the Théâtre de l'Odéon during the May 1968 uprising in Paris. SQEK was sandwiched in between a play about nurses in Vietnam, and the final performance of Judith's own anti-war epic, “History of the World.” We passed the red jar, and raised some money for the perpetually under-funded Living. The next day we were set to talk at 16 Beaver Group in a more intimate circle. On my way downtown I stopped off in Tompkins Square Park, where some folks were gathering for an afternoon of left-centric events. Drums were booming, clowns were prancing – this was a “Pop-up Town Square,” the first of numerous “mobile, daytime occupations” which are promised in NYC over the next few months. This is an OWS-related Facebook-driven project, and looks to be a try-out zone for a lot of interesting activist manifestations. If that sounds vague, well, that's kind of the modus operandi here. “It's a surprise.” Still I saw some old friends, like Wendy Brawer of the Green Map project, and Alexis Bhagat, sonic geographer extraordinaire, and gathered up an armful of leaflets, including a glossy printed OWS projects list. Much scheming is afoot, and longing gazes have been turning towards the huge bulk of the El Bohio building on 9th Street, the ten-years-vacant neighborhood social center. I didn't catch a lot of the talk at 16 Beaver, since I was cooking spaghetti with my son Taylor! But one of the SQEKers remarked later to me that he was glad to hear members of our group relate personal tales and anecdotes, rather than discourse academically. 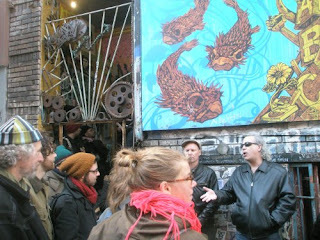 We wandered off when our time was done, but the evening saw members of the Occupied London collective talk at 16 Beaver. Their work is an invaluable source of counter-information on the Greek struggle against the austerities. Occupied London published a magazine at one point, and I cribbed a number of their marvelous graphics for “House Magic” exhibition wallpaper. In the evening we met nearby with the O4O group, Organizing for Occupation, which is allied with the homeless advocacy group Picture the Homeless and Take Back the Land. This is the group that has been doing foreclosure defense in NYC, interrupting auctions by singing the original ballad “Mr. Auctioneer” (see the videos), and generally raising the ruckus of a political squatting movement in the USA. SQEKers and friends heard about the legislative and direct action strategies that PtH and O4O have been pursuing, in partnership with the growing national Take Back the Land movement. Rob Robinson, Frank Morales and others impressed us with their determination, and passed around their latest accomplishment – a handsomely printed report, “Banking on Vacancy: Homelessness and Real Estate Speculation” (PDF online). This document reflected the work of volunteers doing a count of vacant housing in NYC, showing that just a third of this vacant stock could house all of the city's homeless. It hasn't happened, we're told, because of the fabulous profits that cronies of the city government receive from the homeless shelter system. SQEKers enthusiastically agreed this is a strategy that could work in their towns. The next day we spent at the Graduate Center, City University of New York, talking wiith students and others at a research seminar and then another public presentation in the evening. That talk was sponsored by the Center for Place, Culture and Politics, and arranged by oral historian Amy Staracheski. That afternoon we missed a chance to Skype chat about the Oakland Commune's attempt to establish a social center earlier this year. Brandon Jourdan made a film about it – but a spokesperson for the group who was in town could not make it that day, and the SQEKers decided to pass on this talk. I posted a text by the Oakland Commune in this blog earlier, and I strongly recommend Brandon's films. This was an important action, expensive for the participants, but hopefully prescient, and Brandon is one of a handful of journalists who is following the global new '68. Finally, Friday night also saw a reception and splendid exhibition at the Interference Archive in Brooklyn. The archive made a near last-minute decision to mount their own materials about squatting in Europe – brilliant colorful posters and long shelves of books and zines – together with the research collection of my own “House Magic” project. SQEK members arrived exhausted after the all-day panel sessions, but the “SQEK Library” continues at Interference Archive, as a 2012 “footprint” of the conference. On Tuesday after the conference, several of us went along to a conference at NYU for the East Village Other, the famous underground newspaper of the 1960s. I jumped up in question time (about 1:16 of the tape) and asked the panelists if they had any recollections of political squatting, big building occupations, and communes in the East Village during the 1960s? (I knew of these only from Samuel R. Delany's book “Heavenly Breakfast” of 1979.) After the talk, as we scarfed up NYU's sandwiches and wine, a woman named Lola Cohen told me of a Dutchman, Steef Davidson, editor of the “Kabouter Kernel” in Amsterdam, who had lived in the neighborhood in the 1960s. This moves the horizon of Dutch New York City squatting interchange back a couple decades! That night the remaining SQEKers met for the last time to watch Matt Metzgar's band perform at a local bar. Bill Di Paola gave us all hats for the newly launched Museum of Reclaimed Urban Spaces, and we kissed goodbye. Everyone enjoyed these events with their unusual mixture of activists and academics. For me, this conference event and archive installation completes the work of the “House Magic” project. My intention was to introduce the European movement of political squatting and big-building occupations called social centers to the U.S. public. That work is definitively done. What's next? Well, there's the work of processing and digestion after this conference. But “House Magic” is going to have to turn a corner. We'll see what lies ahead. Photo: SQEKers visit the Interference Library exhibition. Left to right, IA collective members Molly Fair (inclined head), Kevin Caplicki (with camera) and Josh MacPhee (in red hoodie); NYC SQEK organizer Amy Staracheski (with baby). On the Greek Riots - Occupied London: Offers irregular updates and articles on the situation in Greece.